I recently finished My Life in France, by Julia Child (written with her nephew, Alex Prud’homme). I had been amazed to read elsewhere that one meal had awakened her dormant passion for all things food, and I wanted to know what that meal was. Julia went on, in turn, to awaken passion in many Americans. Her first book, Mastering the Art of French Cooking, written over the course of several years in collaboration with two friends, Simone Beck and Louisette Bertholle, was published in 1961. Within 2 years, she appeared on our television sets, quirky and lanky, amusingly natural, and was awarded an Emmy in 1966. How could one single meal be so pivotal in someone’s life? I found it amazing and yet not surprising that 55 years later, well into her 90’s, Julia vividly and intensely recalled its every detail from 1948. To hear Prud’homme describe their collaboration on My Life in France is to appreciate the gratitude he had for the opportunity to reconnect as well as his high regard for her dedicated creativity and determination. One meal sparked Julia’s mission, and later his. The first sentence in the introduction reads, “This is a book about some of the things I have loved most in life. . .” and the last page ends with her characteristic “toujours bon appétit.” In between are innumerable and enthusiastic accounts of being at table with friends, relentless perfectionism in testing recipes, conversations and lessons from her teachers – who could be found anywhere from exalted roles at Le Cordon Bleu, to small stands at Parisian vegetable markets, to behind the counter at her favorite patisseries. I wondered what would have ever happened to Julia – as I wonder about many seemingly innocuous choices and circumstances in my own life that end up having the most profound effect – if she and her husband had simply driven straight through to Paris after their boat docked in Le Havre in 1948. 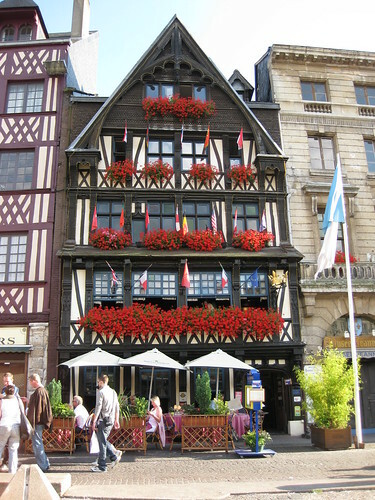 What if, I thought, Paul Child had decided not to stop for lunch at one of his favorite restaurants in Rouen, on the Place de Vieux Marche where Joan of Arc had been burned at the stake? In 1345, La Couronne had come to be, and ever since it had been serving up a Norman interpretation of sublime. What if Julia had never sampled the smooth and briny portugaises (oysters on the half shell) accompanied with crisp pain de seigle (pale rye bread) and buerre d’Isigny (light, unsalted table butter)? What if Paul had ordered something other than the sole meuniere that transported Julia to describe it as a “morsel of perfection” with its “light but distinctive taste of the ocean” more than 50 years later? What if she had declined to drink the Pouilly-Fume that accompanied the fish and salade verte with vinaigrette, or had no baguette – with the “crisp brown crust giving way to a slightly chewy, rather loosely textured pale-yellow interior, with a faint reminder of wheat and yeast in the odor and taste?” No fromage blanc with cafe filtre to close the meal? Julia maintained that lunch was the most exciting of her life. I was excited by that, off at a ramshackle pace to devour the rest of the book recklessly and rapidly. Turning the last page a day later, I reflected on whether one (meaning me, of course) could have had such a life-changing meal herself. Could I even remember the details as vividly as Julia had? Did I realize its significance at the time? I couldn’t bear to think that serendipity or circumstance may have taken my path right past the door of my personal La Couronne without my ever knowing! Quelle tragédie! Meals in our house growing up were hardly as adventurous. Just as the movie spoofed “If It’s Tuesday, It Must be Belgium,” we knew if it was hot dogs it must be Saturday, or if it was chipped beef on toast my dad was on strike at the factory. I could relate to what Julia described as nutritious, but unexciting food during her girlhood. When my brother and I shared an apartment, he was working in a factory, saving money for chef school. Instead of soup stock, he was pouring molten brass in large, dangerous vats. We laughed at our parents’ propensity for describing what they had to eat via long distance telephone. What time had they arrived to get in line at the dinner buffet? What appetizer had a neighbor brought over for Happy Hour? Your dad made his gravy, they’d report. When John went off to the Culinary Institute of America, they traveled across half the country to Hyde Park for his graduation, where they ate in the student-run Escoffier restaurant. 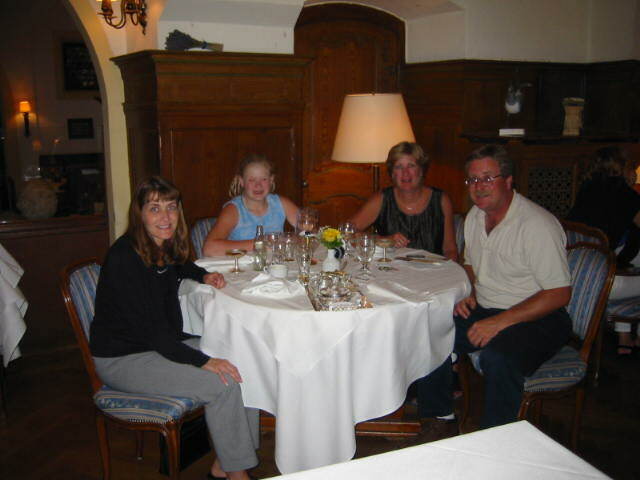 My father proclaimed it the best meal of his life, the cuisine flavored in part with their pride on that happy day. For my wedding and other special events, John subsequently provided platters of cunning little animals and flowers, carved exquisitely from fruits and radishes. The remarkable whimsy! He would show up bearing the fabric roll that cradled his expensive German steel knives. I learned from him and later observed in others that talented cooks revere their cutlery and it needs to be just so. 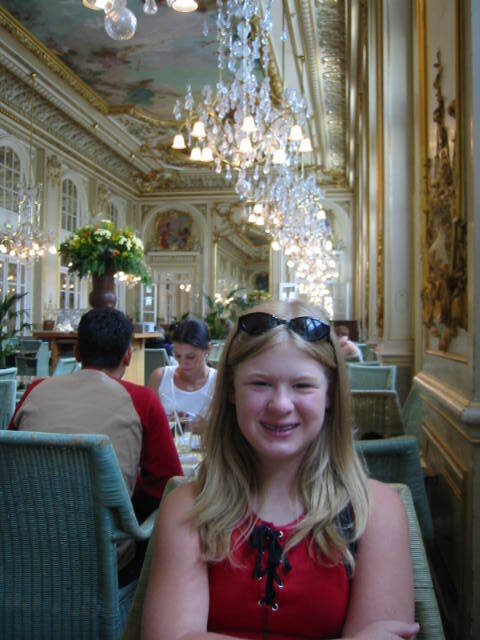 It was during this time that my 12 year old, Robin, and I traveled to France and Germany. It was a life-changing trip, to be sure, and there are several meals that we shared that could hold a title: a grand lunch at the Musee d’Orsay; dinner at a tiny restaurant in the 7th arondissement – where a grandmother leaned over and exclaimed “Bonne idée!” to Robin, who was expertly sopping up the butter sauce from her escargot with her baguette; dishes of wild game and sauerbraten shared in Heidelberg with John and his new bride, Gwyn; outdoor dining at the homes of German friends near Stuttgart. There’s a point in every dating ritual where the participants entertain in their respective kitchens. To my relief, Peter Wuebker had proved to enjoy all kinds of cuisine, though he turned out to be less fond of Italian than I. To my delight, he intimated of culinary accomplishments, with a propensity toward Asian flavors. Upon my return from Europe, Pete decided he would cook me a meal in my kitchen one day, and I was happy to let him. I expected this meal to be good, if only because he had something to prove. I wasn’t disappointed. As Julia did with her lunch at La Couronne, I remember this dinner at my house, cooked in my kitchen, with exquisite detail. It was on this night, over Scallops in Jade Sauce, that I decided Pete Wuebker might be a keeper. I was banished to the living room after the wine (a nice Vouvray, I might add, since I selected it – the poor man’s Pouilly-Fuisse) was opened, where I listened to the clatter and sniffed the aromas wafting in from the kitchen. Ginger and Chinese chili sauce. Never one to shy away from spicy, he told me later he used cayenne to add color before the broil. I was called to the table adjoining the kitchen, and seated with a flourish. Presented to me that fateful evening was the dish you see here. It was marvelous. The scallops were plump and chewy, and the cayenne gave them a bounce. 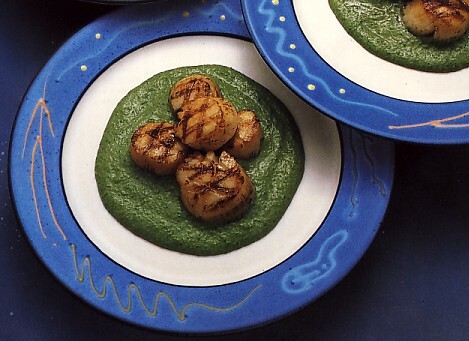 The jade sauce, consisting of spinach pureed with heavy cream, was the perfect counterpoint, both visually and on the palate. The ginger and basil notes in the recipe behaved as yin does with yang. 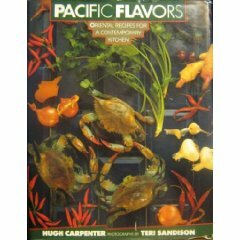 Carpenter says, “Nowhere is the versatility of Oriental cooking better demonstrated with seafood. 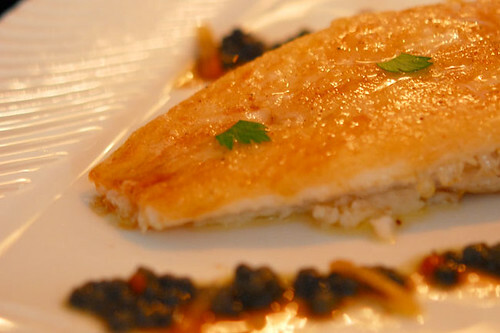 The ability to use sauces interchangeably, or substitute one type of fish for another, or vary the cooking methods leads to exciting new combinations.” The everyday ingredients in Carpenter’s recipe merged with the seafood in a freshly, surprisingly beautiful blend. And Pete had added his own unique twist with a characteristic red dash of pepper. Flushed from the August heat, which was well-supplemented by the broiler going full tilt, we ate and talked. The candles burned, the wine was finished and we sat back in our chairs. I could hear the buzz of insects on the window screen, and muted voices of neighbors on their porch down the street. Things were settling in, and it was deliciously comfortable. I wonder what you would consider a life-changing meal? Did you realize it at the time? With whom did you share it? What was on the menu? Is it captured in every detail and nuance by your memory? Sustenance to me comprises well-being and comfort, not opulence, but certainly the luxuriousness of intimacy, delight and trust with one another. I’ve received it in generous amounts from the people who value me, and I have tried to reciprocate with those whom I hold dear. These meals of the spirit are often offered and accepted in the context of simple hospitality, at table. Julia Child recognized this and made it her life’s work. The rest of us can also recognize and enjoy. Toujours, à la vie, bon appétit! It wasn’t a single meal, but over the course of a couple of decades, experiencing different cuisines in many different areas of the world and realizing how much we love and appreciate good food. .-= Vered – Blogger for Hire´s last blog .. Sin City Pictures =-. Hi Betsy. The way to a woman’s heart IS through their stomach too, so I see. What a special meal Peter prepared for you. Sounds absolutely scrumptious. I haven’t had one of those meals… yet. During college, I shared Chinese food at the beach with one of my boyfriends. Does that count? .-= Davina´s last blog .. If You Could, Would You? =-. Hi Betsy – That restaurant in France looks awesome. I like good food – sometimes Michelin stuff and other times simple but well flavoured things. There is a reason the cook book was so well worn beyond its age (I think I got it as a gift some 25 years ago). It is just a joy to use. Great recipes, of course, but what I like most is that it has lots of great photography. I probably never would have picked that recipe if it wasn’t for the image. Now here’s one to think about, what would have happened if my mom had never given me the book (Probably my mom)? All these little tiny events could be related. 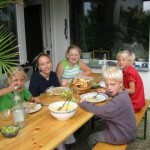 .-= Pete´s last blog .. A MEAL COULD CHANGE YOUR LIFE =-. So the next morning he hands me the recipes. He’d spent all night looking them up on the internet and writing them down (no printer). I was absolutely boggled. .-= Hayden Tompkins´s last blog ..The Lens of Love and Fear =-. I have to believe that if Julia Child and her husband had skipped lunch that fateful day that she would still have found her inspiration. I just refuse to believe that destiny would allow such a gift to go undiscovered forever. .-= Kathy | Virtual Impax´s last blog .. What Michael Jackson can teach business about social media… =-. Hi Vered – Isn’t it amazing the more you learn, the more you appreciate? The places I have enjoyed the most have all had folks working there whose enthusiasm was infectious. Thanks. Hi Davina – LOL perhaps so on the heart/stomach connection. For me it was more about not having to be anxious about what someone couldn’t or wouldn’t eat, though. Yes, I think Chinese on the beach might count! Depends on what happened next! 🙂 Thanks. 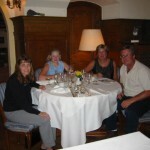 Hi Cath – Doesn’t La Couronne look great? I bet you could take the Chunnel right over there for lunch, right? I’ve heard of Gleneagles somewhere else, I can’t remember. I should put it on my list of places to go. Thank you. Hi Hayden – Now all night researching is an element of true love! LOL! Yes, these scenarios all have humor in them, too. That’s what makes them great. Remember the infamous dinner scene in When Harry Met Sally? Life-changing, too, if only for the neighboring woman. Thanks! Hi Kathy – I agree, it’s hard to imagine that Julia wasn’t destined for what she did. Also, you could be right about giving Pete another chance in the kitchen. . . I’ve yet to be disappointed, although for the first time ever this year, he burned chicken on the grill. Julia said that a cook should never go on and on about mistakes. Instead host and guest alike should just push aside their plates and move on. Good advice, don’t you think? Thanks. And wonderful to be here and find your blog today! I really enjoyed this post and must say it was an amazing reflection not just of Julia’s life but also of how significant various episodes are in each of our lives. I think great cooking is really and truly an art – not any different than painting or being a musician. And as for me, it sparked me right away when you asked the question about having a life changing meal – indeed I did have one. It is not at all though what most people would expect I think. 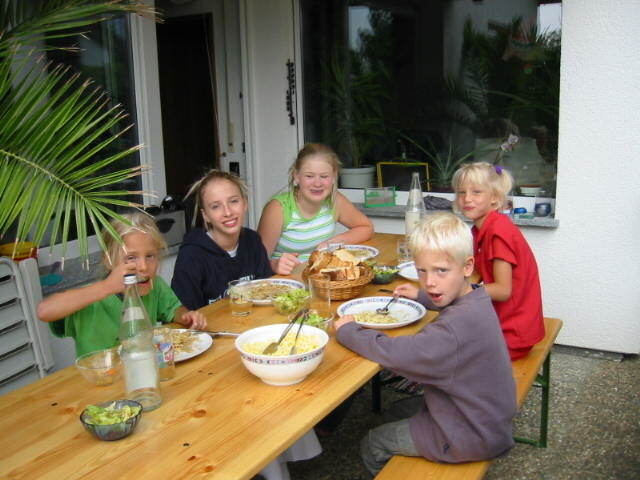 It was Thanksgiving Day in 2007, and as our whole family sat down to the feast filled table, as I reflected on what was on that table, the significance of that meal I had many awakening realizations come to me during that meal. It was the last meal I ate that contained “animal flesh”. From that day on I was a different person. Like I said it is not what most people would expect, but life transforming moments come to us in all sorts of ways, and at all sorts of times. Did I know it at the time? Oh yeah. You know those moments we get to where we know there is no going back, well that was one of them. Hi Evita – Welcome to PassingThru! I agree, cooking is truly an art to which science has been married. Wow, your story is a life-changer! And you’re right, sometimes we just know right away and take the first step forever changed. Glad you enjoyed this post and hope you stick around. Thank you. Hi Betsy – I enjoyed reading this so much that I don’t know what to say! The whole thing is exquisite! Yum. I’m lucky that my mother was and is a very good cook – so though we grew up eating the conservative meals of the day (grilled lamb chops, mashed potato, sausages, boiled cod – not all at once), it was always good quality cuts of meat and cooked perfectly and tastily. One family favorite was crayfish with buttered brown bread, salt and lemon, eaten out of the paper on the table. This has all left me appreciating good food – thank goodness. .-= Robin´s last blog .. Physical Immortality Discussion On Oprah.com =-. Wonderful post! In my vast venerable all-powerful mother-like age, I approach cooking the way I approach writing software – I know what I have to start out with..but what I end up with nobody would ever have believed! It’s a secret joy of mine. .-= Barbara Ling, Virtual Coach´s last blog .. BY Invitation ONLY – Income Fitness Launch =-. Hi Robin – Good old-fashioned plain food, well-prepared, is never unappreciated by me! The crayfish you described sounds wonderful! I have a fond memory of visiting a friend in Maine. When the tide would go out in front of her house, we would gather mussels, throw them in a big pot and steep them in white wine-flavored stock. Yum! Thank you. Hi Barbara – One of the things that drew Julia to experiment was her scientific mind – sounds like you share that in common with her! There IS joy in the surprise, isn’t there? And yes, the kids have their preferences. Oh well, they eventually do come around. Thank you. What a fun post! My family still focuses so much around cooking and the kitchen — even when we are cooking over a campfire! My life-changing meal came when a barely-known friend of a friend invited me out with a group to an all-you-can-eat place. 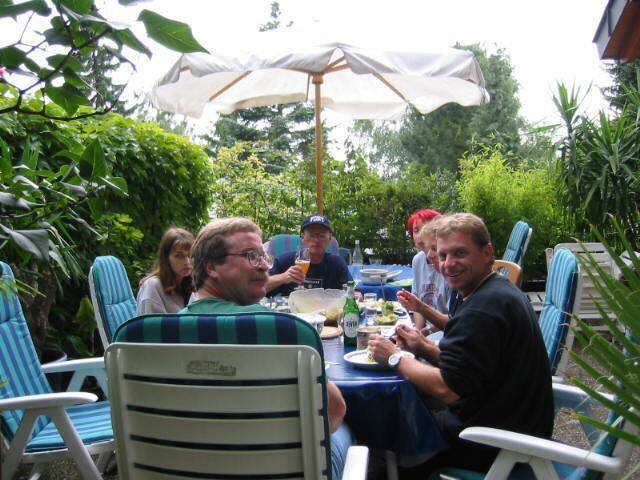 The friends left, and we remained to talk and talk for hours about science fiction, religion, and life. We married eight months later. Our 16th anniversary is next month. .-= Lori Hoeck´s last blog .. What you can do about a shooter in the building, part 2 =-. Hi Lori – Congratulations! I’m sure the years have flown by! An eight month courtship is a whirlwind, but when you know, you just know, don’t you? Yes, I think there is a reason everyone tends to gather in the kitchen when families and friends visit, and around a fire, too, if it’s available. Thank you. My mum was a fair to medium cook, but she never prepared enough as her goal to never have leftovers. I learned early in life that I loved to cook, and I usually spare no expense when working on something new and delightful. I loved Julia Child as a kid and when home in recovery after surgery my Father purchased a TV and I was allowed to watch her program to stay quiet. She was so honest and funny, I just loved it…I truly enjoyed the movie too. I am just too tired to make applesauce or dry the apples…. I don’t want to….I would rather eat a cup of yoghurt than cook another casserole – or as today grill pork chops which I can not eat. Neat piece and I am glad I finally got on your site and not the error message . Lovely writing as always. 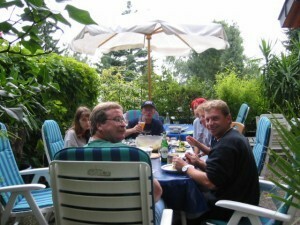 .-= Patricia´s last blog .. Rumbledethumps =-. Hi Patricia – Thank you! Yes, I caused the error and John Hoff of WPBlogHost came to my rescue. He is truly my hero, as this entire blog disappeared and he captured it back. I like to be waited on in restaurants, too. Both Pete and I have waited tables in our lives and we were proud of the job we did. It’s painful to see less than good service. And we love eating out when traveling. Glad you had a great trip and can’t wait to hear more! .-= Davina´s last blog ..Laziness is Like What? =-. What a beautiful post and story of your love developing over great meals. Me? A life-changing beer was it. Can’ t remember if we ate or not, probably not. I was too smitten with the tall tan Texan. .-= Jannie Funster´s last blog .. Post-Vacation Contemplation =-.